Looking for Wing Chun Personal Training or Classes in Nottingham? Tuesday & Thursday 7.30 - 9.00pm. 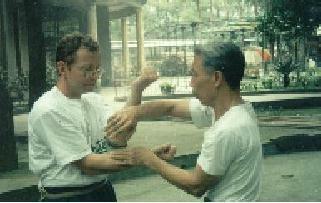 What is Foshan Wing Chun? What Happens at our Beeston Wing Chun School? Although all adults over 18 are welcome we especially cater for mature individuals including those considering a change to their current system or activities. We also welcome women who wish to learn self defence. At our Beeston Wing Chun classes we concentrate our Wing Chun training on partner work, sensitivity drills (chi sau), forms practice (similar to Karate katas), reaction drills and Wing Chun techniques such as lap sau, and self-defense applications. Power development is practiced, such as inch punch and pad, shield and wooden dummy work. Semi contact sparring and the distinctive chi sau sparring is also practiced when students are confident and controlled. Eventually the weapons of the system are employed (butterfly short swords and pole). Are there alternatives to Wing Chun Classes? Yes, Personal training ( One to one ). You can be taught in the comfort and privacy of your own home (travel costs apply) or at our Beeston Venue. I can also travel/host small group seminars. You might also consider Chinese Combat Fitness ( A sort of Boxercise ) £9.99 for 30 mins and Womens Self Defence and the martial aspects of our "No Faith" Tai Chi lessons. What Do We Expect of Students? Videos from my kung Fu Older Brother's Sifu. Videos from an inheritor of the Chu Shong Tin lineage. Student of Joseph Cheng, whose single-handed and single-minded analysis of the fight is a must for martial artists.